It looked like a multi-coloured version of the squiggle people do when they are trying to get a pen going. It might have been a wiring diagram for a Toyota Camry had it not been for the words “Subway Map” in the bottom right-hand corner. They were the only words in English: the station and line names were all in Japanese. 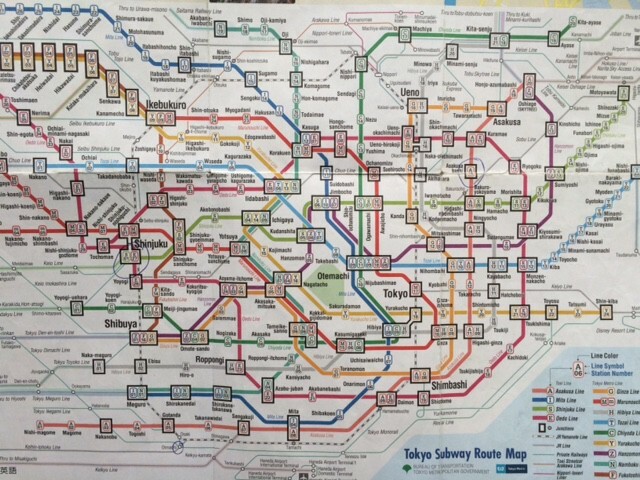 I compared it with the subway map which came with my guidebook, but it might as well have been for a different city. Neither seemed to reconcile with the map in the back of the leaflet I had picked up at a station I passed through earlier. It made no sense. 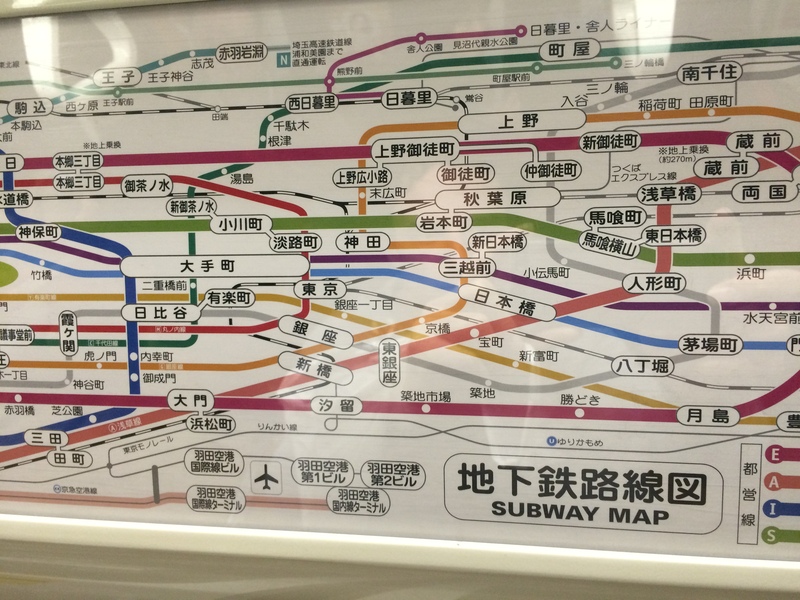 I got off at Shinjuku and went through to the ticket hall to try to find a better map. I remembered then why I had heard of Shinjuku: it is officially the busiest station in the world. Some 3.64 million people pass through it every day, roughly equivalent to the entire population of Los Angeles, or the combined populations of Birmingham and Greater Manchester. They all seemed to have arrived at once. I stood, bewildered, with my guidebook in one hand and my baffling map in the other, looking from one bank of searing neon to the next as busy people in suits knocked me this way and that. There were fifty-one platforms to choose from, and two-hundred exits to leave by if I decided to bugger that and get a taxi. Somewhere amid the mass of humanity, under the kaleidoscope of neon, behind all the cheerful jingles to announce that a train was arriving or leaving, on one or other of the Yamanote Line, Chūō Main Line, Chūō Rapid Line, Chūō Sōbu Line, Shōnan-Shinjuku Line, Saikyō Line, Odakayu Odawara Line, Keio Line, Keio New Line, Maranouchi Line, Toei Shinjuku Line, or Toei Ōedo Line was the train I needed to take. There was only a 50:1 chance of getting it wrong. I struggled with a combination of maps and signs, got on a train and counted off the stops. Then – to my astonishment – I was back in Ōimachi, right where I had started two hours before. All of the maps agreed that that was impossible. But there I was. For a good two days, I tried and failed to understand why all the maps seemed so very different, how two stations could be adjacent on one map and have five or six stations between them on another. I followed signs through stations the size of airports, which took me up through three levels of platforms, out through shopping malls and down the street, round the corner, to a different station entirely. It all remained a mystery. Then I found out that there are two separate subway networks, the four publicly-owned Toei Lines and the nine privatised Tokyo Metro Lines, and another dozen or so networks of mass-transit railways, some owned by the state, some by private companies, which connect with, run parallel to and operate in much the same way as the subway network but are not technically part of it; then there are a further sixteen suburban lines. There are different maps for different networks. It all made sense then and, in time, I could use the system without a map and a vacant expression. I thought that I ought to have got a certificate or something. At rush-hour it hardly matters whether you know where you ought to be going. 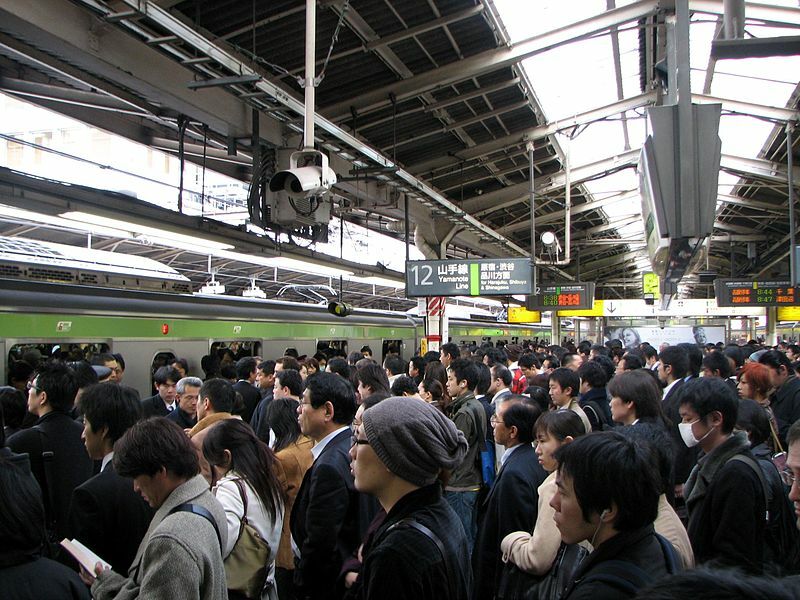 A Tokyo commuter crowd is like a fast-flowing river. Only the strongest can swim against the tide: the rest are swept along with the current, forced round obstructions and out into the open sea. If the crowd transfers to the Hibuya Line, then so do you; if it takes Exit A, then you take Exit A as well; and if the crowd stops off at a department store to buy a tie then you need to think quickly what colour would go best with your shirt. I so identified with this. I felt the same a few years ago when I was in Tokyo and got lost trying to get the right train back to my hotel at shinagawa station. 🙂 it’s an amazing piece of engineering but definitely overwhelming! At least it’s not just me then 🙂 Mind you I once told a tourist on the London underground that she was on the wrong train and gave her detailed instructions about where she needed to be then found out, at the next stop, that it was actually me that was on the wrong train!